To understand the history of Shorei-Kan Karate, one has to go to the birthplace of Karate itself. Situated in the China Sea about half way between Southern Japan and Fukien Province of China, lies a small string of islands called the Rykyu Islands, Okinawa being the largest and the home of Karate. Being situated where it was, in the middle of a major trade route, Okinawa was strongly influenced by Japan, China and south Asia. The Okinawans were a very quiet and peace loving people, but like all ancient cultures they had to protect themselves from thieves and pirates, especially when on the merchant ships plowing the China Sea. As in other cultures, Okinawans had their own early self defense art called “te”. In the twelfth century the islands were divided into three kingdomes and in the early fifteenth century Sho Hashi united all the kingdoms. During the fourteenth and fifteenth centuries, trade flourished and the influence of China was very strong. In fact, for a long time, Okinawa paid tribute to the Chinese. At that time all weapons were barred from the common people. This situation led to an increase in the development of empty hand fighting techniques as well as a strong development of kobudo (using every day utensils as weapons). All this was done in great secrecy. At this time there was also a very large Chinese community living in Okinawa including monks and Kung Fu masters. A blending of the martial arts occurred and the Okinawans called this art “Tote” (Chinese hand). In 1609 Okinawa was invaded by the Japanese Shimazu Clan and for 270 years remained their protectorate. 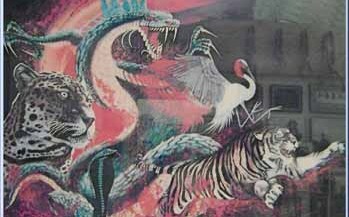 To keep control of the population they continued the ban of all weapons and fighting arts for all Okinawans. Martial artists were always very secretive and this drove them even more underground, but probably also increased the necessity for promoting the use of te and kobudo. 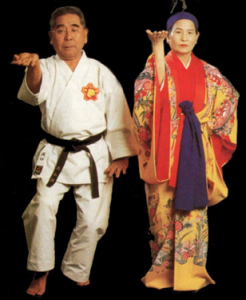 The techniques of karate and kobudo were also hidden in Okinawan dance. In secret the kata could be performed alone or in groups keeping the art alive. By this time there were three distinct styles of karate developing each named after the city where it was practiced. Naha te, from the port city of Naha, Shurei te from the capital city of Shurei, and Tomarei te, from the city of Tomarei, half way between Shurei City and the port city of Naha. Karate being so secretive, was only for the accepted students and so was taught on a personal level and there was nothing written down. Usually only the top student or protege would be taught the whole style. If there wasn’t a worthy student, the school had the potential to die out. In 1879 the kingdom of Okinawa was dissolved and Okinawa became a prefecture (province) of Japan. With this development, karate and kobudo were incorporated into the school system and the Okinawan martial arts became public. The name “karate” probably came into existence sometime during the beginning of the twentieth century. To de can also be pronounced karate in Okinawan both meeting Chinese hand. In the year around 1915 the Japanese were quite anti-Chinese so they changed the first character to the homonym kara meaning empty, thus we get to today’s version of karate or empty hand. During this period the Emperor of Japan travelled to Okinawa and saw a demonstration of the art of karate and later there was a demonstration of karate in Japan at the Budokan and as a result karate was accepted as a formal martial art. In 1936 Gichin Funakoshi opened the first karate dojo outside of Okinawa in Tokyo. After World War II, Okinawa was home to many large American military bases. For the first time, large number of Westerners came in contact with karate. The first American Shorei Kan instructores were students at the Shorei Kan Dojo in Koza city training with Master Seikichi Toguchi. From there, Okinawan Karate spread throughout the world. Born on April, 1888 at Haigashi, Naha, Miyagi came to inherit the fortune of one of the wealthiest families on Okinawa. Thus independently wealthy, he was able to devote his life to the exclusive study of the martial arts. He began his training at the age of eleven under karate master Aragaki Ryuko and in 1901 Chojun Miyagi was introduced to Master Kanryo Higashionna. Under Master Higashionna students would learn only one kata suited to their temperment and body type, becoming highly proficient Chojun Miyagi, however, was able to learn all aspects of Naha Te. He was the only student of Master Higashionna to learn all the katas of Naha Te. Because of his great wealth, Chojun Miyagi was able to house Master Higashionna and so he remained in his constant company. Miyagi Sensei studied under Master Higashionna for fifteen years until the Master’s death. After his master’s death, Master Miaygi journeyed to China twice to study and collect further literature on the martial arts. A pioneer in internationalizing karate, he also traveled to mainland Japan and Hawaii to spread its doctrine. It was during a demonstration on the Japanese mainland by Master Miyagi’s senior student Jinan Shinzato, that the styles name came into question. Back then in Japan all recognized styles had a name. Jinan Shinzato was unable to give an accurate reply when he was asked so upon his return to OKinawa he consulted with Master Miyagi. Master Miyagi came up with the name Goju Ryu taken from a line of the Bubishi, a record of the eight precepts of Chinese Kempo. Go Ju appears in the sentence, “Ho Goju Dont” (the way of breathing is hardness and softness), describing the hard and soft of his style. Thus Go Ju Ryu was the first style of karate not named after the city of its origin. In 1933, when Dai Nippon Butoku Kai (the largest martial arts organization recognized by the prewar Japanese government) was established, Master Miyagi, as the representative of the Okinawan martial artists, presented his article, “An Outline of Karate-do”. As a result of his presentation karate received formal recognition as a Japanese martial art. Master Miyagi himself was awarded the title, Karate-Do Master, the first master in the karate world so designated. Although Master Miyagi’s command of the art was profound, his greatest achievement was the organization of karate teaching methods. He introduced preparation exercises, supplementary exercises, Hookiyu Kata (unified kata), Kihon kata (basic forms) and relaxing exercises, all truly epoch-making developments in karate teaching. In addition, his classes in junior high and police schools helped redefine karate’s public image. At that time, public opinion held that karate would make a person poor or fond of quarreling. Master Miyagi’s work, however, disproved these myths and presented a more accurate picture of karate as a martial art and physical exercise. Master Miyagi was called the last great samurai warrior of Okinawa and held the title of Bushi. Master Miyagi died of a heart attack on October 8, 1953 at the age of 65 and because of his sudden death no official successor was named until Miyagi’s family bestowed his belt and Gi onto Meitoku Yagi. After Master Miyagi’s death various schools of Goju Ryu were opened by his senior students. Meitoku Yagi teaching at his Meibukan school, Master Seikichi Toguchi at Shorei Kan, and Miyazato at Jundokan. Master Seko Higa is quite often relegated to the background or mentioned as a student of Master Miyagi, but is really a contemporary of Master Miyagi as a fellow student of Master Higashionna. 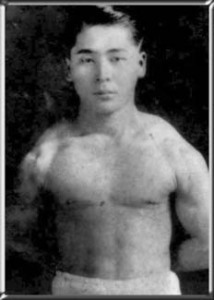 Master Seko Higa was born on November 18, 1889 in Naha City and began training at the age of fourteen with Master Higashionna. After the death of Master Higashionna. he continued his study of Naha te with Master Chojun Miyagi. At the age of 21, he began teaching elementary school and later worked with the Okinawan police. In 1932 he decided to make karate his full time profession and opened a dojo in Kumoji and was only one of three authorized dojos from Master Miyagi. Master Seko Higa also spent two years teaching in Indonesia and when he returned to Okinawa was awarded the rank of Renshi or seventh dan from the Butokudai. After the second world war Master Higa came to live with Master Seikichi Toguchi, one of his earlier students, and with the help of Master Toguchi opened a dojo in Okinawa. Many considered Master Higa the best technician of Goju Ryu. He passed away on April 16, 1966 at the age of 68. Master Seikichi Toguchi was born on May 20, 1917 in Naha City, Okinawa. As a young boy his father trained him in the basic techniques of Okinawan Te. In 1930 at the age of 13, Master Seikichi Toguchi began his life long study of Goju Ryu karate at the dojo of Master Seko Higa and later under Master Chojun Miyagi as one of his principle students. He studied under Higa Sensei for over 33 years and under Miyagi Sensei for more than 25 years, making his karate education very unique. Master Toguchi was fortunate as Master Miyagi was a personal friend of Master Toguchi’s father and so paid many visits to the family. At these times the conversation most always turned to karate and the discussions would go on till the early hours of the morning. Master Toguchi continued his full time study of karate till the beginning of World War II when he was drafted into the army as an electrical engineer and stationed in Sumatra, Indonesia. In 1946 he returned to Okinawa to find a devastated people and homeland. Miyagi had lost three children and one of his senior students, Jinan Shinsato. Higa Sensei had lost his wife. Master Miyagi began teaching at the police academy and Higa Sensei moved in with Toguchi Sensei. At this time Higa Sensei also played match maker and introduced Master Toguchi to a young girl named Haruko, soon to be his wife. 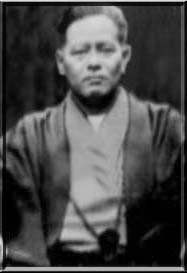 In 1949 with the help of Toguchi Sensei Master Higa opened up a new dojo and Toguchi Sensei was appointed Shihan. Before his death Master Miyagi passed on all his advanced kata and teachings to Toguchi Sensei, one of the more important being kaisai no genri. This explains how to unlock the hidden techniques of the koryu kata. In 1953 after the death of Master Miyagi his senior students formed the Karate-Do Goju Association, with Master Meitoku Yagi as Chairman, and Master Seikichi Toguchi was Vice Chairman. In 1954 Master Toguchi opened up the first Shorei-kan Dojo (House of politeness and respect) in Koza City, Okinawa. The Shorei-Kan dojo was very close to the American Military base and the Americans showed a great interest in the martial arts. With an increasing western population in his dojo Master Toguchi found it necessary to devise a progressive teaching method to over come the language barrier. Expanding on Miyagi’s vision, Master Toguchi further developed a system of progressive kata and added bunkai kumite and kiso kumite to help explain application of the kata. 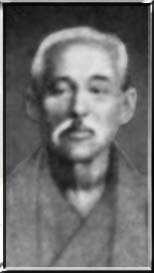 Many of the early pioneers of Okinawan karate in the US studied with Master Toguchi. In 1956 the Okinawan Karate-Do Federation was formed and Master Toguchi was installed as a member of the board of directors. By 1960 Toguchi Sensei decided to move to mainland Japan to spread the art of karate and Shorei-Kan. During the coming years he would move between Okinawa in the winter and Tokyo in the summer months. He first practiced outdoors at the Hikawa Shrine where he developed the kata Hakitsuru. In 1962 the first Shorei-Kan dojo was opened in Tokyo in Meguro Borough and in 1966 Shorei-Kan Hombu Dojo Tokyo was built with the help of Tomano Construction (founded by Toshio Tomano’s father). Master Toguchi passed away at the age of 81 in Tokyo on August 31,1998. He was the last living Okinawan master to receive the title of Bushi a title also held by his teacher Master Chojun Miyagi. He touched the lives and hearts of all his students and his spirit will touch the lives and hearts of generations of students to come. Master Toguchi left behind a strong organization that has spread through out the world and with his spirit, the Instructors of today will continue his vision. On August 31, 2004 Mrs. Haruko Toguchi Kaicho, wife of the late Master Seikichi Toguchi took retirement as the head of the Shorei-Kia. She returned to her home in Okinawa to enjoy the warm sun and to be with her family. Madame Haruko Toguchi in Okinawa passed away on June 22, 2012. She was renowned for her Okinawan dancing in her own right. Mrs. Toguchi became the Kaicho of Shorei-Kai after her husband’s passing and held this position for six years. She will be remembered by all as a kind and caring person and major supporter of the Shorei-Kai.